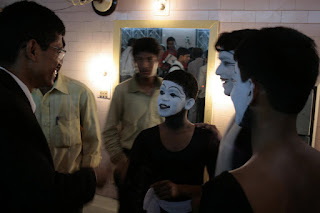 Today is a watershed day in the history of Indian Mime. People had to stand on the aisles. I was late due to my pre occupation in my office , when I went there it was too late. After 53 years and countless laughs, the Charlie Chaplin of Kolkata performed his last show today before the audience at Rabindra Sadan. Silently, as always.The show is over. After his final show on Friday, Jogesh reappeared on stage, dressed in white shirt and trousers, and laid his wig and costume on the floor. Fittingly, the ‘poet of silence’ didn’t utter a word. But to those who clamoured for the show to go on, he assured that he would continue to teach mime. And thus, mime will live on. He signed autograph on the leaflet for me. Still I met him in the green room. Pierre took the picture. He cried on the stage. However Pierre was able to see the show. When India awoke to a ‘new dawn’ on 15 August 1947, a five-year-old boy, his siblings and parents found themselves on a platform at Calcutta’s Sealdah railway station. Penniless refugees from East Pakistan, the family, like lakhs of others, faced a dark future. Sixty-two years and one week later, the ‘boy’, now 77, stood under the arclights, hands on his chest, tearful and facing a packed house at Kolkata’s Rabindra Sadan, while the national anthem played on. Friday, 21 August, was Jogesh ‘wordless wonder’ Dutta’s last act on stage, bringing to an end a glorious, 53-year career that won him accolades and awards from across the globe. A pioneer in mime, he washed dishes at a tea stall, was a grocer’s assistant and worked at construction sites before finding his true calling. His parents died when he was very young. He grew up in his uncle’s house and ran away since he was tortured there. “I was always a keen observer of people and their acts. As a teenager, I used to imitate people, and as word spread, I was invited to perform at colleges, office functions and private soirees. Meanwhile, I also did some acting on stage with a theatre group,” Dutta says. “I didn’t know what mime was about then,” he says. While his inspiration was Charlie Chaplin, Jogesh keenly observed young couples snatching a few private moments on the banks of a lake in the city and started imitating them, much to the delight of his friends and associates. In 1956, he created his first real mime act—a lady dressing up in front of a mirror. 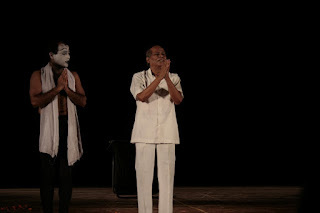 The same year, he regaled spectators with this, in what was also his first stage mime performance, at Bally near Kolkata. “I started getting noticed and invites for shows from then on. The National Youth Festival in 1960 at Calcutta was the turning point,” he recalls. “Invitations from all across the country, and then the world poured in since then,” says Dutta, relaxing in his well-appointed apartment at Ballygunge Circular Road in the city. Previously he used to stay near our house , opposite Dakate (Dacoit’s) Kalibari. 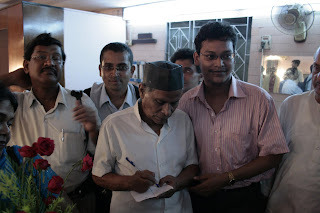 I was lucky to see his show at Jogesh Mime Academy at Kalighat. Dutta’s repertoire includes well over a hundred acts, most of them short and hilarious recreations of scenes from everyday life with a strong undercurrent of sympathy for the poor and underprivileged, with whom he still closely identifies. “I can never forget my early childhood and the difficulties we faced. We were very poor,” he says. Some of his most famous acts in the comic category are Haircutting Salon, Walking, Bus Passenger, A Naughty Boy and A Society Lady, while his sympathy for the underdog comes through in Unemployed Youth, The Old Servant and The Exploited Labour. Jogesh founded his own troupe, Podaboli, in 1971 and started, with the help of the Bengal government, the Jogesh Mime Academy in 1975 to research, revive, train and propagate the 3,000-year-old art of Indian pantomime. The Films Division made a documentary on him in 14 Indian languages in 1983, followed by similar documentaries made by Germany, Britain and France. He received the Shiromani Purashkar in 1985 and the Sangeet Natak Akademi award in 1993. Dutta’s final act was his hugely popular The Thief. “I’m old and can’t take the rigours of staging an act anymore. 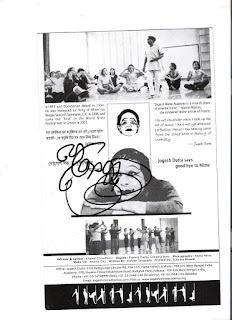 Mime shows require agility and swift physical movement and that’s becoming difficult for me,” he says. Are you free for Lunch tomorrow? Where should we meet? I'm then leaving for Mumbai on Sunday!